Empanadas are a very popular Latin American treat, although originally from Spain. They come in many variations, ranging from savory to sweet, large to small, some baked and some fried. Empanadas make a great party food, simple, delicious, and inexpensive, they are great for a crowd of nibbling cocktail drinkers. They can be made in advance and then baked or fried right before serving. 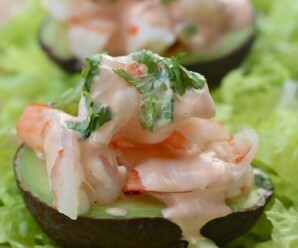 The fillings can be adapted easily, based on your cravings, the occasion, or the season. I love making a big batch and freezing them for quick meals or last-minute parties with friends. Sometimes, the simplest meals are the best. 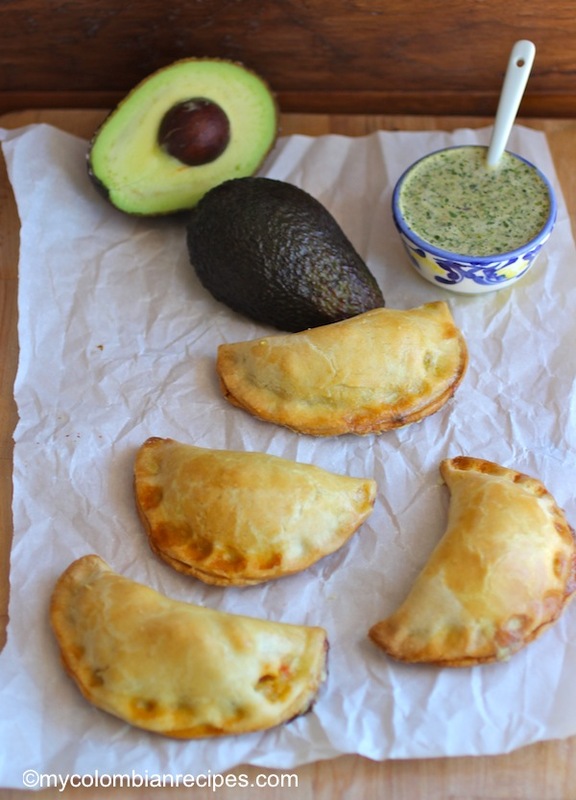 These Avocado Empanadas with Cilantro Sauce are perfect for lunch, appetizer or a late afternoon snack. 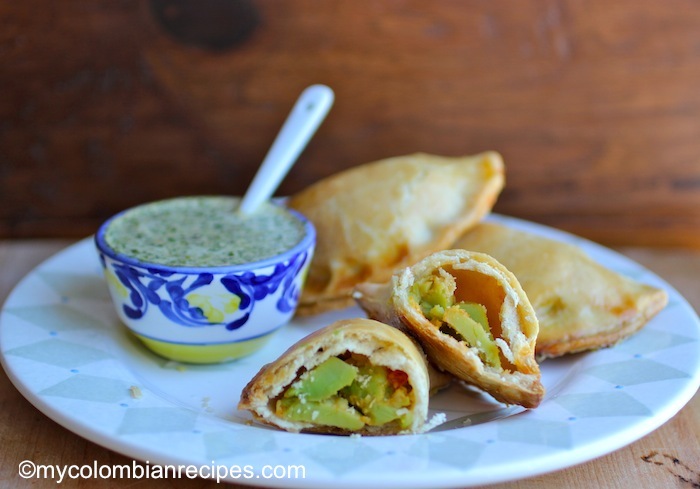 This recipe for empanadas is a new favorite of mine for a few reasons. 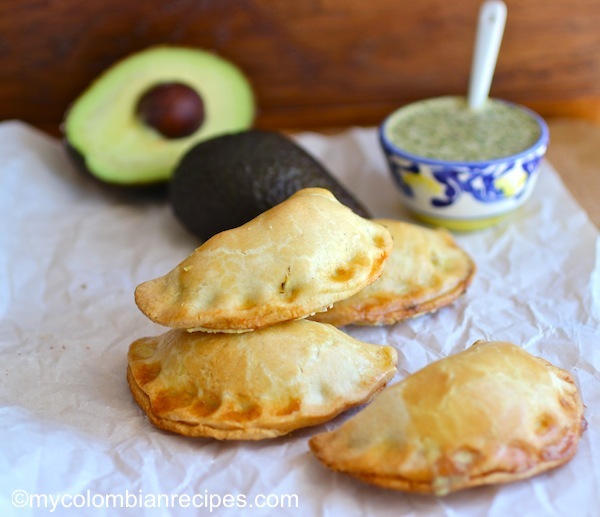 The crust is flaky and buttery, the creamy, bursting with flavor avocado filling, makes my mouth water and the combination of flavors and textures in these avocado empanadas is simply heavenly. So if you’re ever in need of a meatless empanada recipe or you just really want to make some fun hand pies, please give these a try! Like I said, they are very easy to make and are perfect right out of the oven served with my spicy cilantro sauce. 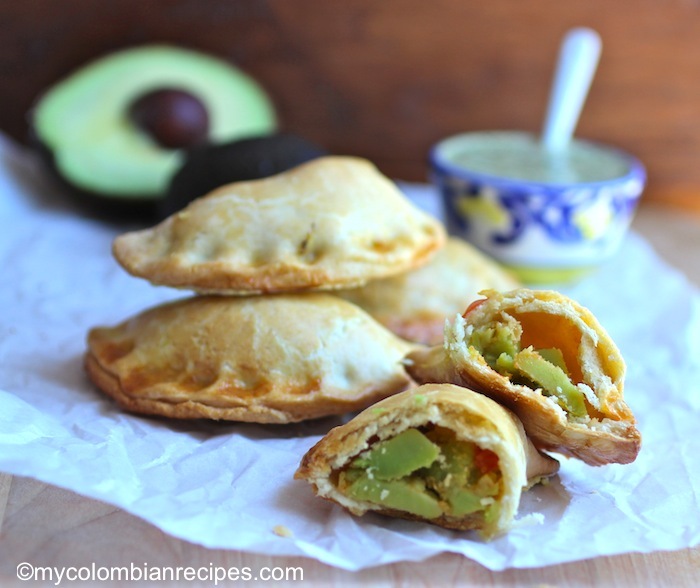 o make the empanadas: Slice the avocados lengthwise and remove the seeds. 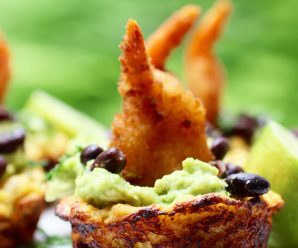 Use a spoon to remove the avocado flesh, place it in a large bowl, drizzle the lime juice on top, and mash the avocados until pureed. I like to leave some small chunks to give it some consistency. Add the diced onion, jalapeño, cilantro, tomatoes and salt to taste. Gently toss to combine. Place the empanada discs on a parchment–lined baking sheet. Place 1-2 tablespoons of filling into the center of each disc, folding in half, and crimping with your fingers or a fork to enclose the empanadas. 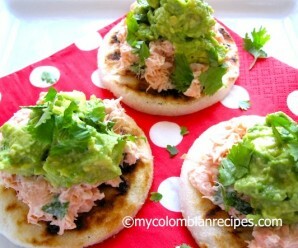 Brush the tops with eggs and bake for about 12-15 minutes, until empanadas are golden brown. Serve immediately with the cilantro sauce. To make the cilantro sauce: Combine cilantro, jalapeño, mayonnaise, garlic, lime juice and cumin in a food processor until well mixed. Season with salt and pepper to taste. Set aside. 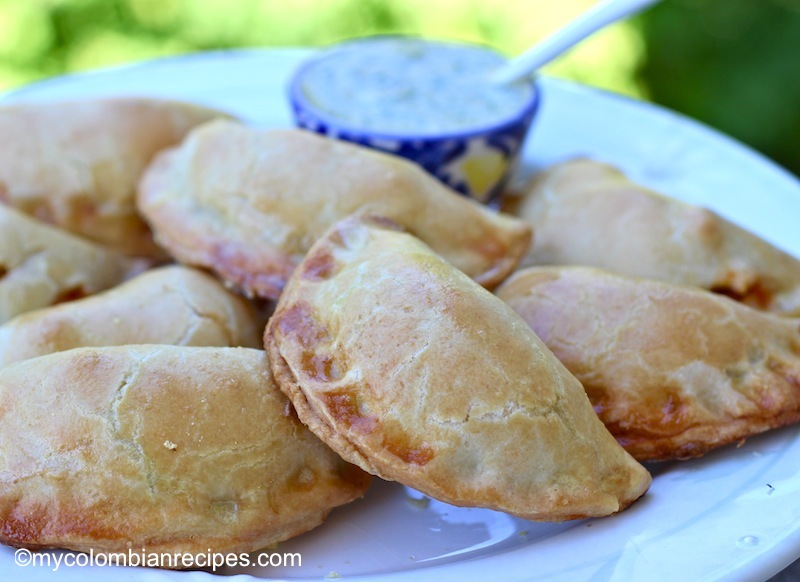 I love empanadas but have not made them myself (yet) – they are on my list! 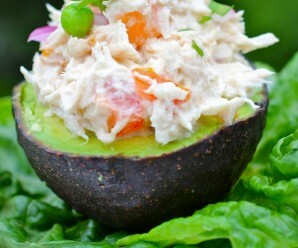 i love this version filled with avocados! 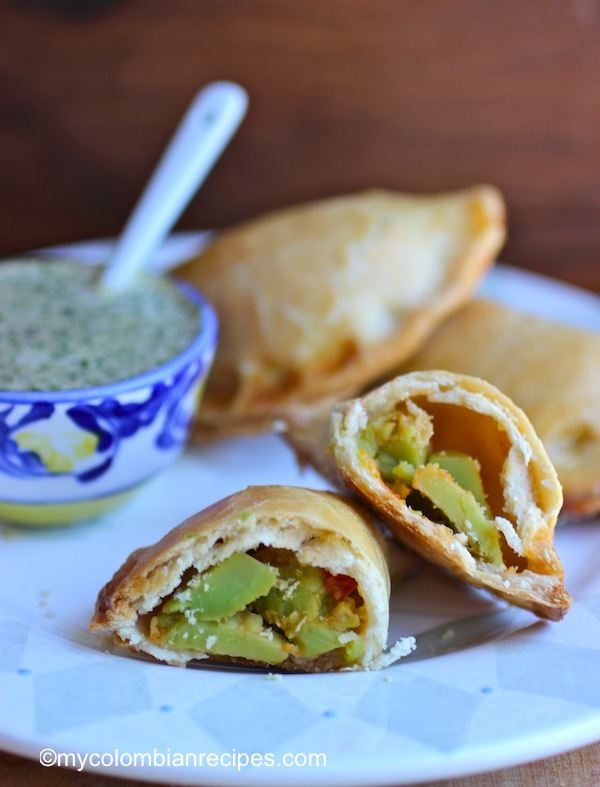 These empanadas with avocado filling looks incredibly delicious, Erica. Very cool to but avocado in empanadas and yes it looks so flaky. Great sauce too. i’m on board for anything avocado, especially when pastry is involved! This is amazing. I might make a version but add some roasted red pepper in the empanada. Love this! I can wait to try this recipe…what temperature do I need to set my oven? 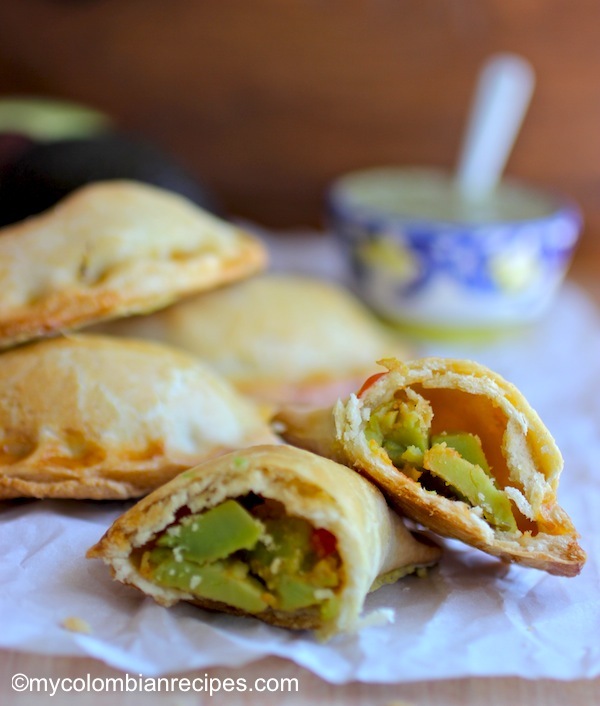 Can we just have an empanada recipe with a range of alternative fillings and how to make them. In our house, a very popular filling is mushroom and onion making a nice tasty (not to strong) filling suitable also for those who avoid meat and fish. I recall that many years ago (about 40+) I used to make a curry flavoured version and a ham in white sauce version but, sorry, I can’t remember the recipes.